For several decades in the 20th century, wall-to-wall carpeting was the modern standard of luxury and comfort for most homes. Many of us have lived in a home featuring powder blue Saxony, avocado shag or beige Berber at one point or another. But with the return of hardwood floors—along with the rise of tile, cork, and concrete alternatives—area rugs have once again become a key design element. Aesthetically, they anchor your furniture, define a space and set the tone of the room. Practically, they provide warmth, soften acoustics and protect the floor from wear and tear. If you’ve been eyeing an outdated or worn-out area rug for a while now, chances are you’re still trying to figure out what you want next, and what will work in your space. With so many options out there, where do you start? Here, some local experts weigh in with a few tips to help you find the right rug for your space. 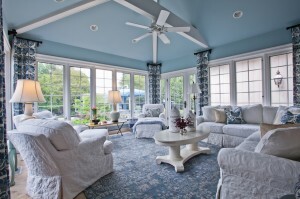 Rug size also depends on furniture and how it will be placed in the room. In family and living rooms, for example, some experts suggest resting just the front legs of a sofa on the rug. 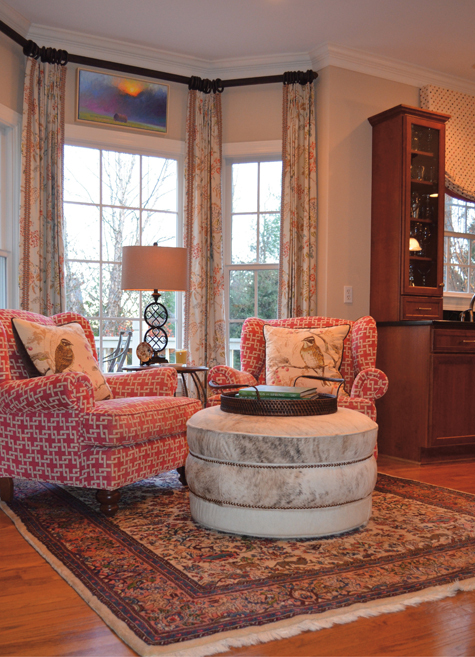 However, Laura Sackett of The Arched Doorway says that when she is helping clients choose an area rug, she likes to place it under the whole seating arrangement, or centered in front of the sofa and chairs or a fireplace. In dining rooms, Sackett says to be sure the rug is “large enough for chairs to pull in and out unhindered, so a person can be seated without catching the edge of the rug.” And in bedrooms, where comfort is paramount, Sackett believes bigger is better. Another tactic here is to place an area rug horizontally under the bed, positioned so that most of the rug is exposed at the foot and sides. The most obvious feature of an area rug can also be the trickiest for many shoppers. More than anything else, color and pattern establish the feeling of a space. 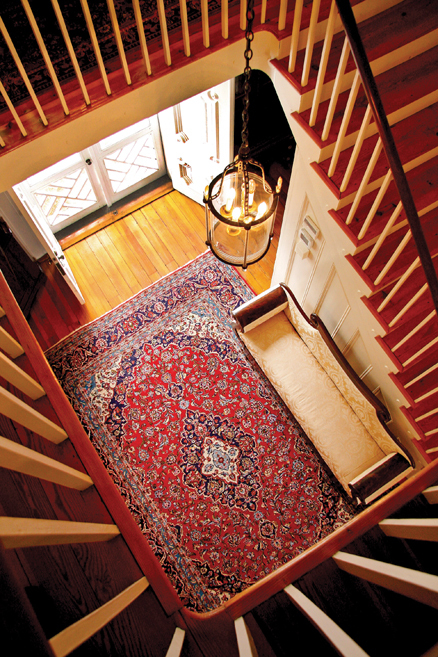 When considering an Oriental rug, Rezai suggests evaluating the amount of light in the room before selecting a design. “If there is not very much natural light,” she says, “then a light-colored rug can lighten up a space. 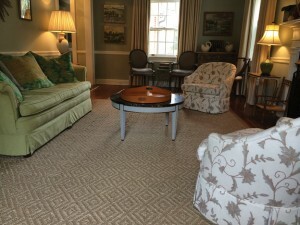 If, on the other hand, there is a lot of light, then you can use a navy or black rug and not darken the mood of the room.” She also notes that, for the first time in her 17 years in business, she is receiving requests for shades of purple in rugs. Sackett approaches color and pattern from the perspective of her clients’ lifestyle. “Darker rugs show lint and dust. Lighter would be terrible if you have a black Lab,” she says. 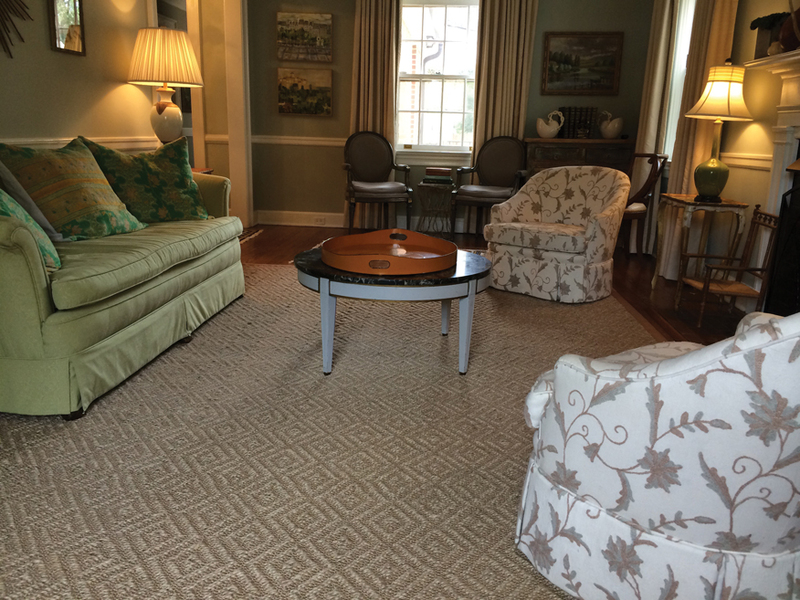 Patterned rugs adorned every High Point Furniture Market showroom that Sackett visited last fall, and she points out that not only are they very much in style, but they also show less wear and tear. Of particular interest at the moment are kilims—a less expensive alternative to Oriental rugs, but with a similar vibe. It’s important to know what a rug is made of and whether it will fit your lifestyle and your space. For example, a natural-fiber rug like jute or sisal can look terrific in a living area, imparting a clean, modern feel and wonderful texture, but would you enjoy it in your bedroom, where it’s the first thing your bare toes touch when you get out of bed in the morning? Also, how much traffic does your space get? The dense construction of flat weave rugs means not only can they stand up to traffic, they’re easier to keep clean. A high pile rug will be soft to sit on and give your room a cozy, luxurious feel, but will show footprints and might be better suited for a less-traveled area. Rugs constructed with loop fibers (like Berber) are not a good choice if they will be in contact with things that snag, such as pets’ claws or children’s toys. A recent trend embraced by savvy homeowners is using indoor/outdoor rugs in high-traffic areas. Sackett notes that a client with young children and a puppy recently bought one for her sunroom and playroom and is very satisfied. 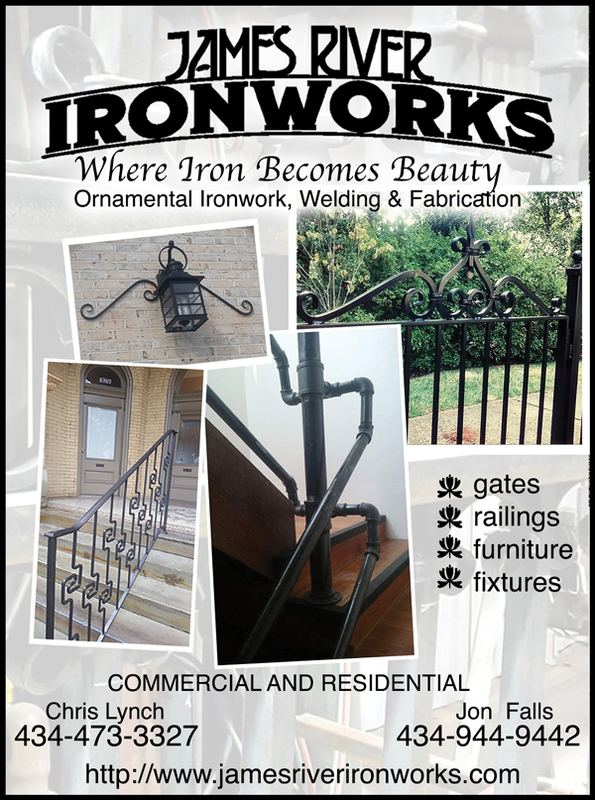 “I predict we will see more of that with all the great-looking choices in catalogs and online. Plus the price is right!” she says. Consider too, the dreaded stain factor. Although many modern fibers are treated with a stain protectant, there are caveats to consider. Rezai says that stains on wool can be treated more aggressively without damaging the fibers, and that polyester, nylon and olefin clean fairly well too. 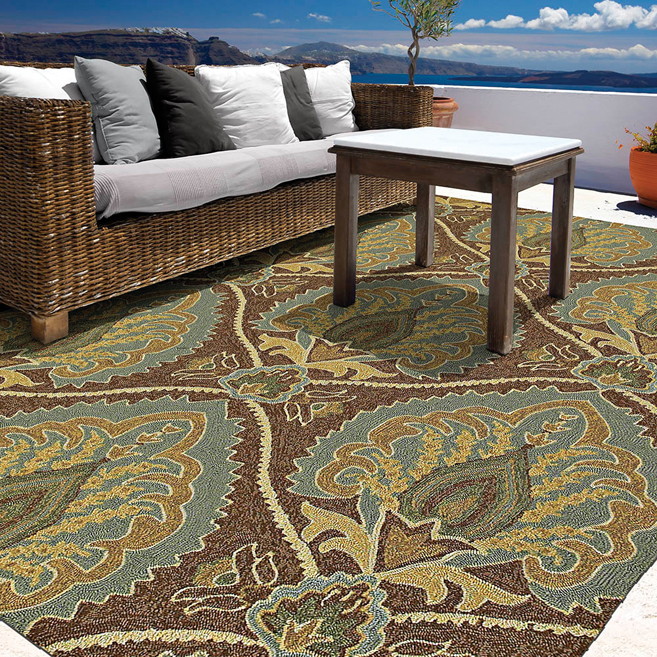 Natural fiber rugs, on the other hand, tend to be trickier to clean. While it’s helpful to do preliminary research online to get a general sense of what you’re looking for, experts agree that there’s no substitute for seeing and touching a rug to determine its true quality, feel and color. “Photographs of rugs online can be very deceiving. 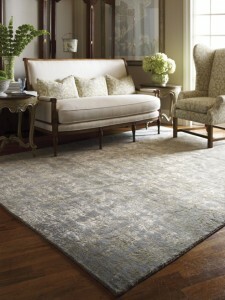 Any reputable dealer is going to allow a customer to try an Oriental rug [at home] before they purchase it,” says Rezai. Last but by no means least, your budget will usually help narrow down the field considerably. Are you looking for something affordable to get you through a few seasons, or a timeless piece to enjoy for years? A hand-knotted Oriental rug is an investment piece, and it’s not uncommon for designers to purchase such a rug first and choose furniture to match. Rezai says buyers should understand that the various styles and materials—from hand-knotted to tufted, machine-loomed to hooked, wools and silks to olefin—all affect the cost, cleaning and collectability of rugs. “Within each category there are subcategories, and customers need some education before they start shopping,” she says. Hand-woven and wool rugs are naturally going to be pricier, while machine-made synthetic alternatives are easier on the wallet and a great way to enjoy trends without overspending. Once you’ve chosen your rug, there’s one important detail homeowners shouldn’t overlook: a rug pad. Rezai says that not only do they help prevent the rug from slipping or shifting and causing a safety hazard, but they also help the rug wear evenly, and soften pressure points caused by heavy furniture. Sackett suggests a rug pad should be cut one to two inches smaller than your rug. Use these parameters to help make your choice, but remember that ultimately, you should buy something you enjoy looking at and feeling beneath your feet. If you buy what you love, it’s hard to go wrong!